AUGUSTA, Ga. — Bryson DeChambeau is accustomed to spending an inordinate amount of time on the practice range. The process never sleeps, and neither, apparently, does DeChambeau, who was the only player on the practice range in the gloaming as he reassessed his opening round with caddie Tim Tucker and Cobra Tour rep Ben Schomin. To be honest, DeChambeau didn’t need to hit an extra bag of balls to work out the kinks. Thursday’s 6-under 66 at the Masters, which featured six birdies on the back nine, confirmed “The Golfing Scientist” would be in the discussion at Augusta National — something DeChambeau wasn’t even sure was possible until last week when he met Schomin at Dallas National Golf Club for a pre-Masters cram session. Rewind the tape to the end of last year and you could argue that, outside of Brooks Koepka, DeChambeau was the best player on the planet. He won the first two events during the PGA Tour’s FedEx Cup playoffs and opened 2019 with victories in Las Vegas and Dubai. He was cruising. And then he hit the skids. DeChambeau is a grinder on the range. It’s not uncommon for him to spend an entire morning on the practice green with his Quintic putting system or make multiple trips to the driving range on a tournament day. But last Wednesday’s range session was on a completely different level. DeChambeau wouldn’t leave until he had an answer, so he and Schomin got comfortable, working their way through his wedge issues — a part of DeChambeau’s game that was rock-solid last year when he ranked 12th in strokes gained: approach-the-green — during a 14-hour session. 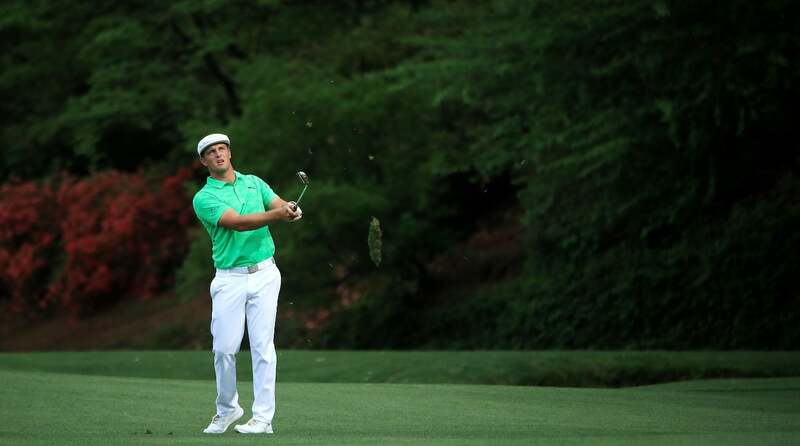 Bryson DeChambeau eyes an iron shot during the first round of the Masters. The advantages were on display during the first round, particularly on the back nine, where DeChambeau started throwing darts, coming within inches of an ace on the par-3 16th and a hole-out from the fairway on 18. It’s impossible to determine someone’s fate at Augusta National based solely on one round, but in a sport where lengthy range work and equipment changes can be validated in one afternoon, DeChambeau saw it all come together on Thursday. All it took was a 14-hour equipment cram session to get there.